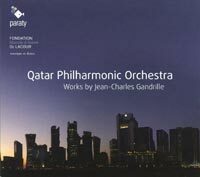 JEAN-CHARLES GANDRILLE (b.1982): Minimalist Concerto for Piano, Organ and Orchestra, Violin Concerto. Description: Two attractive, substantial concerti in a readily accessible idiom. They appear to be the composer's most ambitiously scaled works to date - the Minimalist-Concerto weighs in at almost three-quarters of an hour - and both are traditional in form and the rôle of the soloists. The first movement of the modally tinged, thoroughly tonal Minimalist-Concerto in particular is very clearly influenced by Glass, the other movements less so, although the vigorously propulsive dance-finale also bears an unmistakably Glassian stamp. The parts of the work that have no overt minimalist associations - and overall this is not a 'minimalist work' despite the obvious influences and the emphasis on rhythmic persistence - may fairly be described as thoroughly neo-romantic. The piece starts off sounding like a piano concerto with the organ in a supporting rôle, but in due course the dialogue between the two becomes an important feature of the work's argument and striking texture, and the organ (Gandrille's own instrument) is given some imposing solos all to itself. The orchestration, powerful yet crystalline and pellucid, is an especial pleasure; the central slow movement, a meditative lullaby in the 'new spirituality' mold, is largely a duet between the soloists, with only subtle contributions from the orchestra. The composer was apparently somewhat in thrall to Dutilleux when he wrote 'Beyond, Towards the Azure', which became the first movement of the Violin Concerto, in 2004, as the shimmering, scintillant orchestration and harmonic adventurousness have much in common with the older composer, while some passages of supersaturated orchestral colour recall Messiaen. The finale, a vigorous dance, makes use of central African polyrhythms with Balkan folk idioms thrown in for good measure; lively percussion and a much clearer tonal foundation bring the work to a driven conclusion, finally fading out in an unexpected, distant coda.